Warwick had a number of third, fourth and fifth-grade elementary students compete at the IU-13 STEM Bowl. Warwick’s third-grade team, made up of Alex Ziegler (JRB), Reese Shelley (KH), Kensi Courchesne (LE), and Caleb Jerchau (LE) ended up taking first place against 12 other teams in the IU. They answered tough questions on all things STEM and took part in various hands-on challenges. “The students did a great job sharing their STEM knowledge and answering the extremely hard questions. They were especially able to shine when the four of them worked together to decide on the correct answers,” stated Mr. Jason Balsbaugh, an elementary teacher at Warwick. 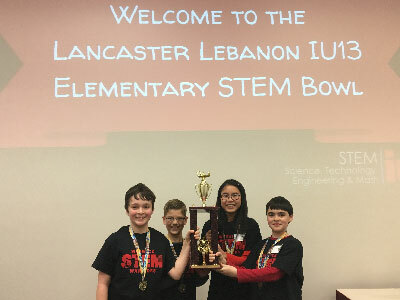 Warwick was also well-represented at the fourth and fifth grade STEM Bowl competition which took place only a few days after the third-grade competition. The fifth-grade students brought home more gold medals and a first place trophy, the team included Seth Jerchau (LE), Nathaniel Kimmel (LE), Rya McKain (LE), and Ian Davis (KH). Mr. Balsbaugh expressed how proud he was of both teams bringing back a win.